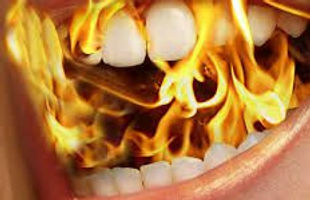 I told you recently in “The Patient Maze,” that I was filming a video interview about Burning Mouth Syndrome last month, and it is hitting the airwaves now. Many thanks to Charlene Bert and her crew from NPN Media who did a great job and were very sensitive and caring during the process. Chicago’s CBS Channel 2 coverage was the first I saw and that link is no longer active. There is a subsequent story (January 2014) that ran in Southern California on ABC and another from CBS Miami and News 4 in Georgia. More recently (February 2014), 19 Action News in Ohio picked up the story and in June 2014 it appeared in Boston. In December 2014, it resurfaced in Milwaukee. I am not thrilled with my appearance in the video. It is obvious this syndrome has added stress, age, and weight to me over the past few years as I cope with it. I know from reading posts from my fellow sufferers on the Facebook Burning Mouth Syndrome (BMS) support group that I am not alone in this. We often only derive complete relief (for a limited time) from eating or drinking and the only long-term relief occurs when we sleep. We take medicines that make us tired and drowsy and often we are affected by varying levels of depression as we realize that this is not going away, we may never know what caused it, and there is no cure. It is truly a sentence without an end date. So, how can you as a friend or family member help? Just check in every once in a while and ask us how we are doing and then don’t be satisfied with a “Fine,” or “Same-O, Same-O” response. Get us to talk a little about it and truly listen. It will help us to relieve the stress because there is great comfort in being heard and understood. We never expect you to “know how we feel.” That would be impossible. But listening, or holding space with and for us will truly help. There may be tears, and those are a good thing because they also relieve stress. There will be times when we withdraw; when talking and smiling and keeping it going is simply too hard. And if you give us a little space and don’t make us feel guilty about it, we will come back. Sometimes we just need a rest. Perhaps one lovely day we will go into remission. Celebrate with us, but know that in the back of our minds, and for the rest of our lives, we will always be fearful that this is not the end of our burning journey. This is not paranoia, hypochondria or even negative thinking. It is simply our reality, as it is the reality for any other chronic disease sufferer who experiences remission. Listen, give us a hug, and let us find our coping strategies. Don’t try to fix us, because quite frankly, you can’t. A wonderful thing I have learned through this experience is that it makes me much more likely to cut others slack when they are surly, withdrawn or simply never return my smile. Who knows, they could be in as much or more pain than me, and less able to cope that particular day. It does change your perspective. As for my tongue, the TV star…no autographs are available. thanks for your info. I have had BMS for 11 months and HATING every minute of it! I also take a very low dose of clonazepam….which I get those looks from medical professionals like I am a psych patient now!!! !…I also have thyroid issues so I am naturally tired…have had a history of horrid migraines, however those have subsided considerably! I will be 54 next month. I am only hoping BMS goes away after I am totally thru menopause!!!!! I wish I could tell you that menopause end is a guaranteed finish date, but many sufferers in the Facebook BMS Support Group have not found that to be the case, and unfortunately, neither have I. Migraines are something I suffer from, as well, but I am having good luck with Memantine right now (knock on wood!) and only had two migraines in the entire month of November. It may be something to ask your doctor about. Good luck, and I wish you a total remission!